The intriguing and much visited coastal area called Cinque Terre located to the north of Massa Carrara beyond Tuscany's farthest north western tip is a favorite day trip for those spending their holiday in Tuscany. Included in the UNESCO World Heritage list in 1997, this fascinating area in the border region of Liguria is comprised of a rough and severe landscape where man-made terraces mold the hillsides as the drop rapidly to the sea. The five small towns, from south to north, are: Riomaggiore, Manarola, Corniglia, Vernazza and Monterosso al Mare have been categorized as a “living landscape” where the location and its history play an active role in promoting the traditional lifestyles and products. Lemons, honey, extra virgin olive oil, anchovies conserved in salt and wines are just some of the special flavors you can enjoy while visiting these colorful towns. There are more than 120 kilometers of nature trails crisscrossing the hills and towns with panoramic views towards the mountains that isolate the Cinque Terre from the Italian peninsula. Dedicate a day or more to exploring each little hamlet, venturing in the vast national park, sailing from port to port and cooling off in the refreshing sandy beaches of the Ligurian Sea. Check out all the hotels, B&Bs, residences and more where you can stay at while in the Cinque Terre, and book instantly through our partner Booking.com. Positioned on the coast of Italy looking over the Tyrrhenian sea, these five picturesque towns will delight and enchant with their colors, flavors and unique traditions. 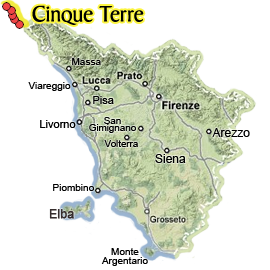 While staying in Tuscany, you can easily plan to visit or join an organized tour of the Cinque Terre. The colorful image it potrays from the ocean reflects the lively and active town life. Even after the damage of the landslide in 2011, Vernazza has cleaned itself off and is one of the best stops on the coast with food, beaches & shopping. Located to the north of Massa Cararra and Viareggio are the breathtakingly beautiful little towns of Cinque Terre. Made famous for their virtually untouched landscape, you need to be prepared to get around like a pro. Here's some basics to know before you go: the all important how to get there and move around! Corniglia, the third of the five coastal towns, might not have easy beaches or a picturesque port but it does have a history of delicious white wine and panoramic views in every direction. With its colorful tower homes, the colorful skyline of against the green terraced hillside makes Manarola one of the favorites with visitors from all over. Ideal for its panoramic views, hiking trails and wandering its quaint streets. One of the main entrances into Cinque Terre is through Riomaggiore, either by train, car or boat, since it is the first town coming from the south. This bustling town has much to offer in sites, panoramic views and restaurants. Check out our recommendations on what to see and do during your visit to Riomaggiore. This deluxe vacation villa built around a medieval tower is a perfect base for exploring the Lunigiana area, going to the beach in the summer or going skiing in the winter in the nearby Apennines. The villa hosts up to 8 guests in 4 rooms, all with a view of the gorgeous surrounding mountains, with a private pool, covered terrace, fireplace and many comfortable nooks and crannies to make it relaxing any time of the year whenever you stay put. Just outside the limits of Cinque Terre are some valid alternatives or beaches, hiking and accommodations. If you are planning on traveling to these colorful coastal towns just north of Tuscany, have a look at these close towns.